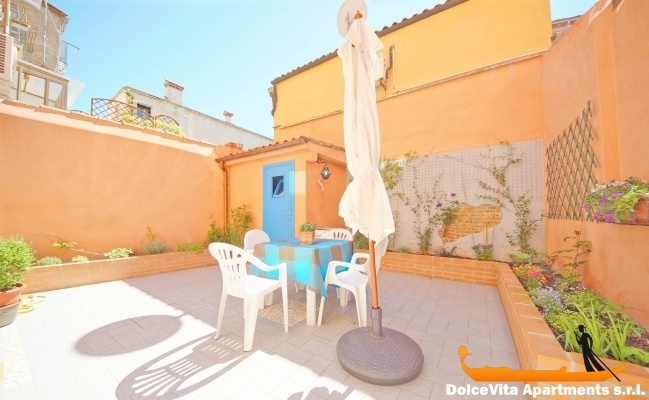 Apartment N. 178: It can accommodate up to 5 people, it is rented from 75 € per Night (not per person). 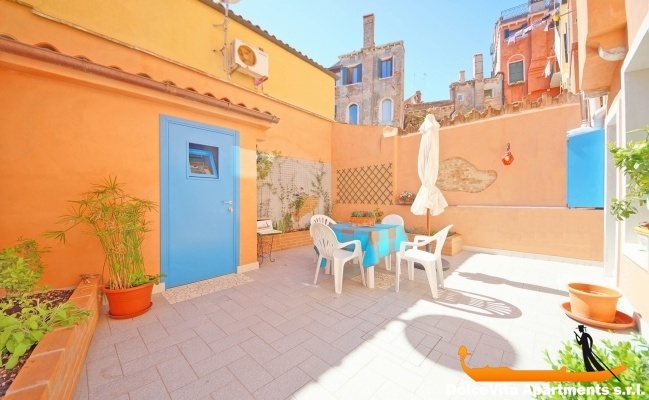 Holiday Apartment in Venice with Garden: This apartment is ideal for summer holidays, especially is suitable for a family of 5. 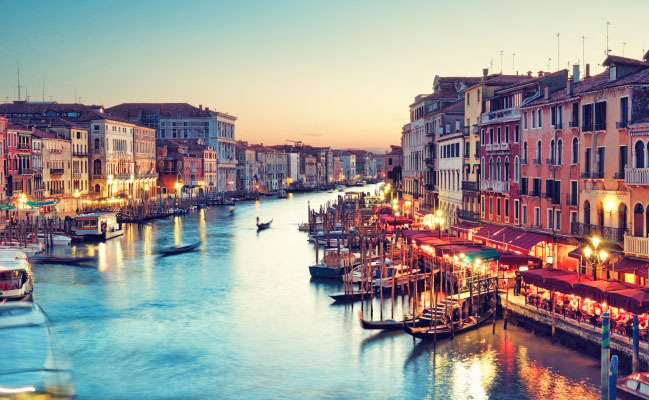 It is a few minutes from Piazza San Marco ( 5 minutes walking ) and it is also close to the water bus stop that takes you to the beaches of Venice's Lido. It is completely renovated and features country-chic style. 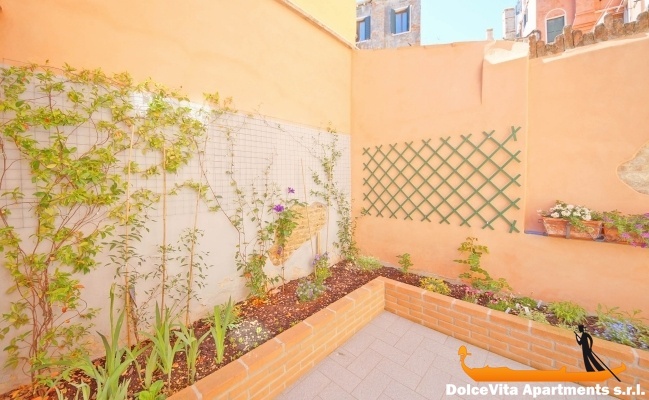 The well equipped garden will allows you to have breakfast, lunch and dinner and to enjoy open air: this is a luxury in the centre of Venice. 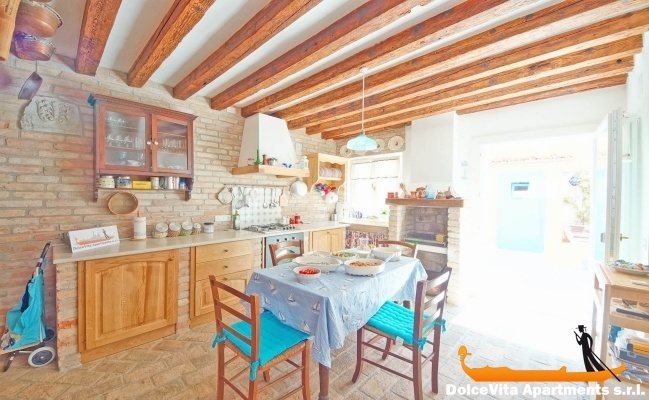 Another feature is the large, fully equipped masonry kitchen with the fireplace and decorated with rustic elements. There is a double bedroom, bathroom with shower, and a double sofa bed ( full double,1 ½) in the living area and a work area. There are air conditioning and wi-fi. The apartment is equipped with sheets, blankets and towels. If you have special needs , we will be happy to help to make your holiday even more memorable . Comfortable, cosy, warm, very special, venezian! I want to be back there. Good service! For the apartment 178 we put 5. 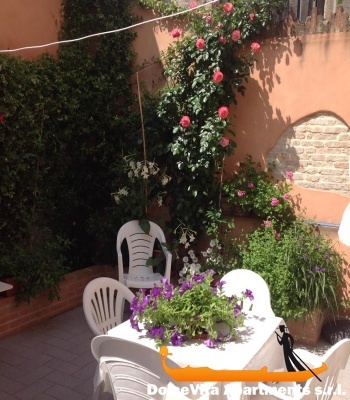 We have just spent a week in the apartment 178 according to our expectations, beautiful and comfortable apartment very well located 10 minutes from St. Mark's Square, the Coop and restaurants. Very nice outdoor space which we enjoyed all week for meals outside. Except for the bedding in the living room is a bit too thin. The service of the company was excellent and Alvise who welcomed us was friendly. 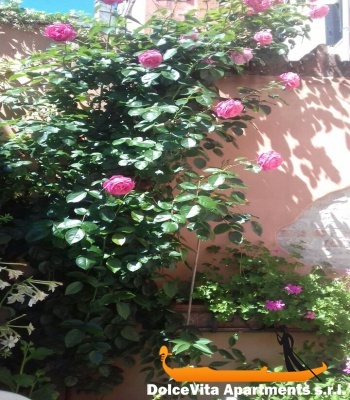 We stayed in a beautiful and characteristic Venetian apartment which completes the holiday of how we are looking to experience the daily emotions of the visited place. The only weakness to report is the mattress of the double sofa bed, not very comfortable. 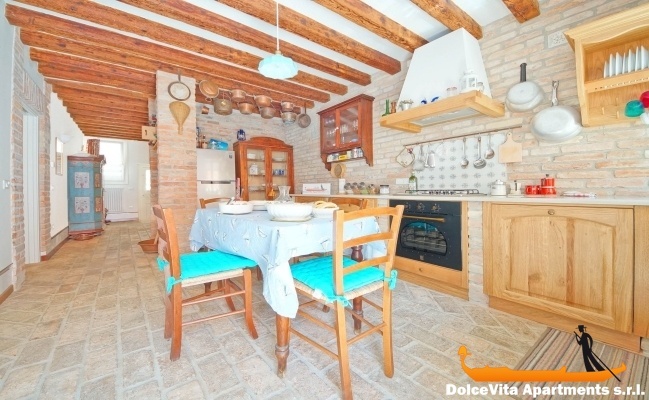 We booked with Eugenia who was clear and very kind; We were greeted by the very quiet Alvise who showed us the house in its details making us immediately feel at ease. I greet you with the hope to return again in your unique Venice, enjoying more of your services. My rating is 5. Comfortable apartment clean enough functional, equipped with appliances and utensils in excellent condition, new bathroom. A stone's throw from San Marco and Rialto, if I were to return to Venice you will probably be the first agency I will contact. 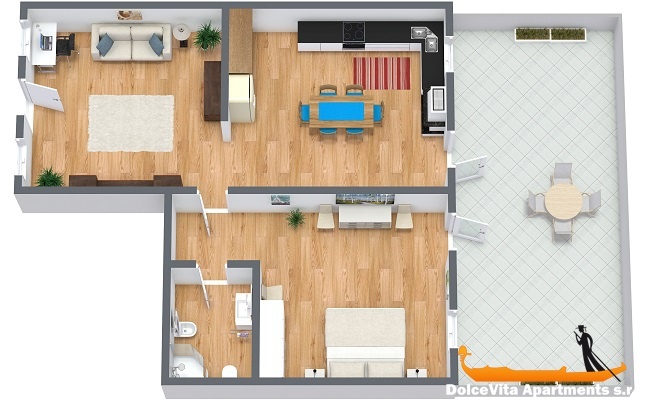 The apartment is in a great location, it is in a very quiet area and at the same time very close to San Marco and Rialto. Apartment clean and well furnished, with everything you need even for long stays, in fact there are a large fridge, oven, microwave, dishwasher and kettle. We stayed for a week on New Year and unfortunately we could not use the terrace that will certainly be great in the summer. The owners were very kind. Excellent apartment in Italian style, very comfortable, close to the center, next time gladly stop here again, if it will be possibility. My family really enjoyed it. Express an opinion about our service: I will definitely recommend your service to my friends, etc. 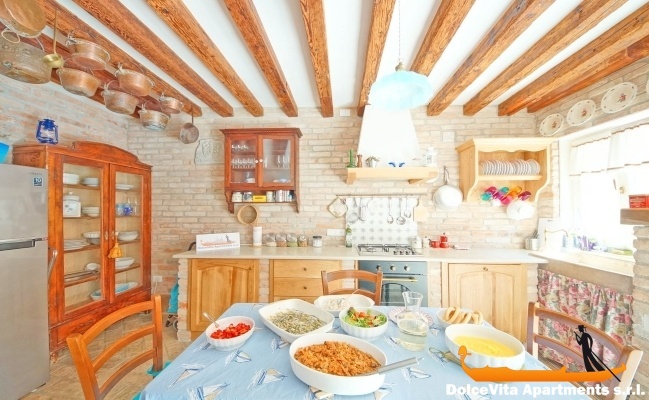 Excellent location, in the historic center of Venice. The apartment is very clean, very well equipped and pleasantly decorated. The small yard is a more certain. We will recommend it to our friends without hesitation. Do not change anything, except maybe the mattress of the sofa bed in the living room, a little uncomfortable. The agency service was perfect, efficient and very friendly. Thank you. 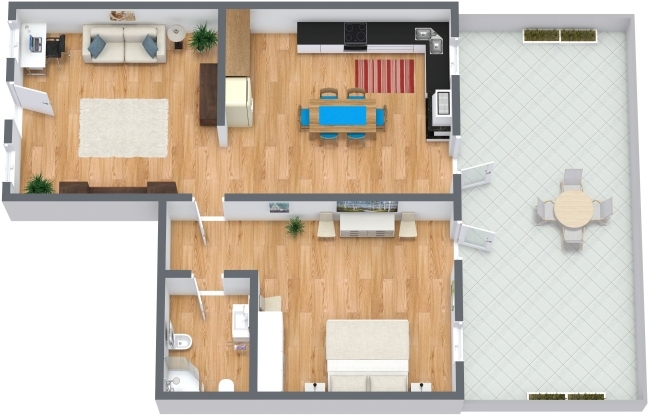 Apartment very well located, clean and comfortable. The only downside are the mattresses, as they were a little soft. Very attentive so that everything was comfortable, facilitating the arrival to the apartment. Timely service, efficient and very courteous congratulations! A comfortable, well located apartment providing a good sense of room.The kitchen is well equipped and we found the open area behind the kitchen perfect for dining . The air conditioner also provided a good respite. The communication from the host was very good. We spent 4 nights in this apartment in June 2017. 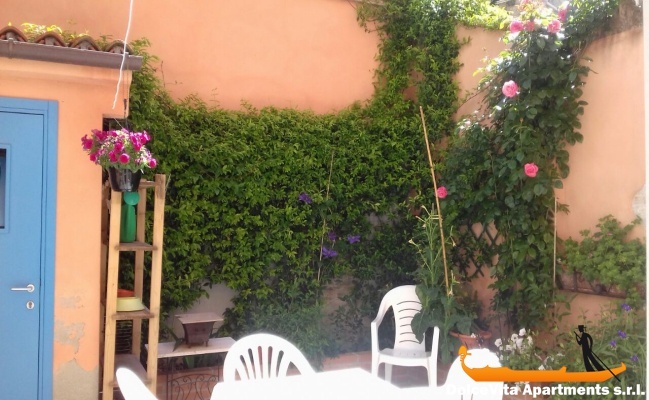 We had specifically chosen the apartment because of the outside space and we loved having breakfast and lunch in the pretty courtyard garden. The apartment is located a few minutes away from the busy tourist areas and we really enjoyed the feeling of living among the locals. The cosy apartment was well-equipped with everything we needed and we definitely appreciated the air-conditioning. The service from the company was excellent. Communications were via e-mail and we received clear instructions with regard to getting to the apartment. We arranged to meet Alessandro in a specific location and he walked with us to the apartment, showing us the key features. We thought the apartment was very good. The apartment was very convenient for getting to San Marco and had many eating places near by. If we were visiting Venice again we would use this apartment again. Nice apartment, well located, well decorated, quiet. We left a fruit press that was missing for the morning juices. The apartment was in line with our expectations and description. Spacious, bright, functional and well equipped. The bedding of good quality and towels supplied in very sufficient quantity relative to the occupants. However, we must point out two things: the dishes were not clean (especially the glasses), and we partially washed them. It would be nice to clean the glass cupboard where the glasses are placed. a leak was detected under the kitchen sink. We tinkered and placed a basin to prevent the floor was wet and stained. It would be appropriate to refer to the owner. We will put a score of 4. Regarding the reservation service, nothing to say, except that the relations and the answers to our requests are of quality and very fast. No worries about booking, no worries for check in, and 'after-sales service' provided for any intermediate questions. If we were to return, we would not hesitate to return to your organization. For the apartment 178 we put 5 points. 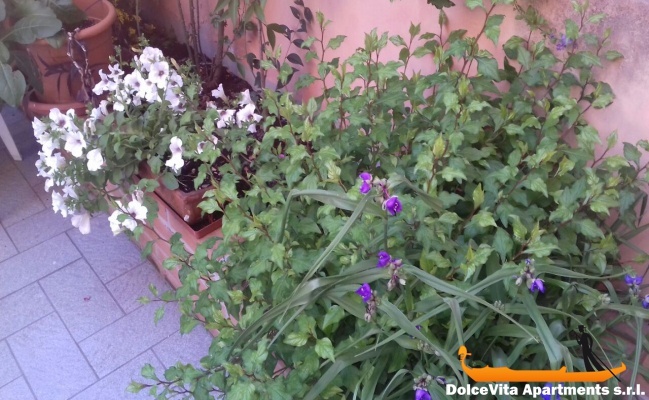 Beautiful apartment, clean, located in a very quiet area and only a few minutes from St. Mark's Square. We really enjoyed this apartment. Only small downside, the bedding of sleeping in the living room (a bit thin mattress). 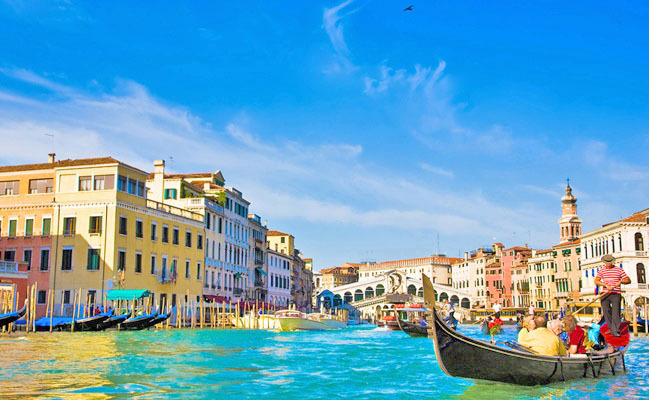 The service is very good and Alvise who welcomed us on arrival in Venice was very friendly. If we were to return to Venice, we would go back to your agency. In short, the apartment is well compliant to photos. The apartment correspond to the description and to the pictures, the location is central and convenient, good cleaning. Very nice outdoor space. The service is quick and efficient, very kind Mr. Alvise who worked to welcome us. Small apartment well furnished, with attention to detail. Delicious and flowery garden. 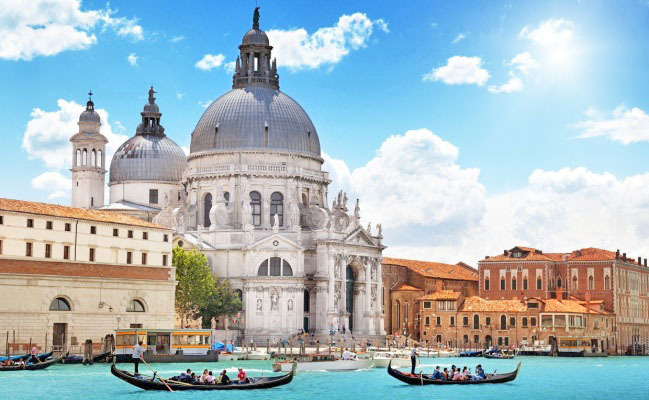 Great location: St. Marco Square can be reached on foot in 10 minutes. Congratulations. Hello, the apartment number 178 is great, very clean and well located.